When Indiana University junior Maria Erlandson is out in nature, she feels free -- free to be herself, free from the hustle of everyday life and free to push her body beyond its comfort zone. She is now hoping to provide that taste of freedom to children, particularly those with disabilities, chronic illnesses or other diagnoses, as a cabin counselor/adventure challenge staff member at Bradford Woods. "Being outdoors with people is really an equalizing experience," Erlandson said. "The different societal barriers, material things go away. You are all just together having the same experience in a raw, natural environment, so it brings out who you really are. "When I was little and outside with my friends at camp, I felt free to get dirty and have fun. Things don't matter anymore; you just have fun. I hope to provide that feeling to these kids." Growing up in Fort Wayne, Indiana, Erlandson was a regular at her local summer camp and eventually began working as a camp counselor. After traveling to Bloomington her senior year of high school to hang out with some of her sister's friends, Erlandson set her sights on attending the Bloomington campus. Her major, however, was not so clear. Erlandson originally planned to follow in her family's footsteps by majoring in English. But her desire to work with children, and her love of the outdoors, led her to recreational therapy. "I took a class for undecided majors, and I found some information on recreational therapy," she said. "I was shocked it was a job that was out there; I had no idea. After researching the program, I realized this is what I am meant to do." For the past few years Erlandson has traveled back to Fort Wayne to work at the summer camp she grew up attending. But after her parents moved out of state, Erlandson decided to stay close to campus and seek a job at a place she had heard so much about: Bradford Woods. Located on more than 2,500 acres near Martinsville, Bradford Woods has been providing recreational, educational and leadership development opportunities to youths and adults from throughout the nation for more than 50 years. 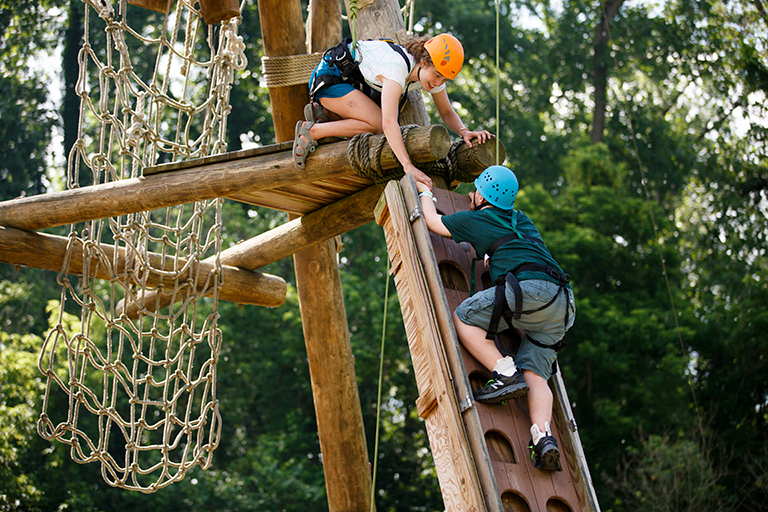 Erlandson will spend this summer working as a camp counselor there, helping to run the camp's 40-foot climbing tower, the alpine tower (a 50-foot-tall vertical jungle gym) and zipline. While she is excited to once again be working with children in an outdoor setting, Erlandson is most excited about working with the various camps created for children with disabilities, chronic illnesses or other diagnoses. "I am so passionate about working with these kids and to really make an impact in their lives," Erlandson said. 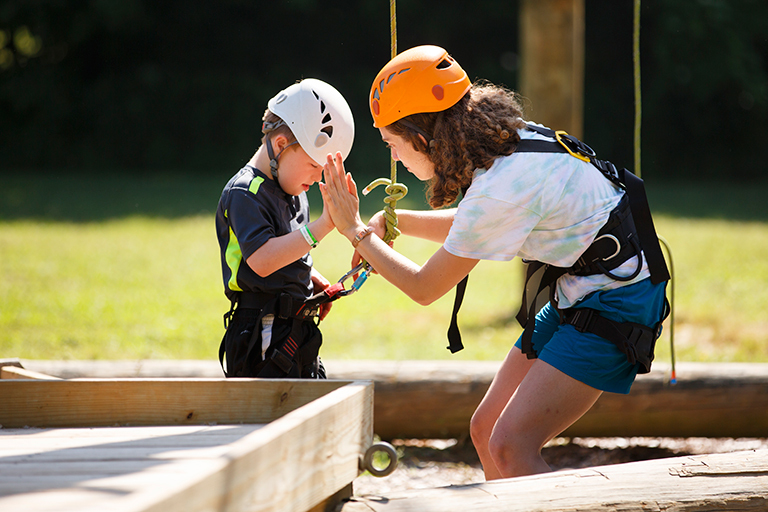 "Being able to help a camper participate in an activity they assumed they can never do, like climb a tower, is so powerful. These campers are so much tougher than they think, and these camps allow them to be surrounded by people just like them, so they can strip away that label they have to wear all the time and just have fun." Her passion for the outdoors and working with children hasn't gone unnoticed during her short time at Bradford Woods. "Maria has been a wonderful addition to our summer staff team," said Lisa Elder, director of recreation therapy at Bradford Woods. "As a student in recreation therapy, she is able to put the knowledge that she has been learning in the classroom into action here at Bradford Woods. Maria is always smiling, and it's hard to not be feeling positive when you are around her. 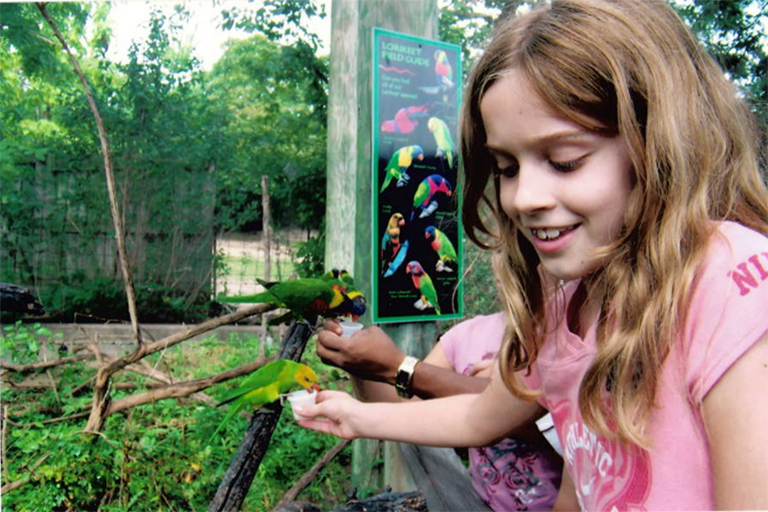 She has a joy and a passion to share her love of the outdoors with the campers." When she's not working as a camp counselor, Erlandson is serving as a trip leader for Outdoor Adventures, where she has found a passion for rock climbing. After graduation, she hopes to travel abroad and eventually work as a recreational therapist, specializing in adaptive adventure sports. Wherever her path takes her, Erlandson said she is thankful for the experiences she has been given so far, and she hopes to take the lessons she's learned about herself and use them to help others. "For me, this summer is all about learning more about what I want to do and working with different groups of people and really growing and learning more about my own strengths and weaknesses," she said. "I hope to eventually use that to really make an impact on people's lives."